On April 28, 2016, UBC hosted Dr. Peter J. Hotez, Dean of the National School of Tropical Medicine at Baylor College of Medicine and Professor of Pediatrics and Molecular Virology and Microbiology. He is also the Editor of the PLoS NTDs Journal and President of the Sabin Vaccine Institute where he leads a partnership to develop new vaccines for hookworm, schistosomiasis and Chagas disease. The seminar can be viewed through a link of this post. This new digital platform linking the global health community at UBC went live on October 17, 2015 during the UBC Global Health Conference. A private network with themed discussions, it is open to all students, residents, staff and faculty who are interested in discussing pertinent global health topics. These rnage from Research & Innvoation, Maternal Newborn Child Health, and Neglected Tropical Diseases to Humanitarian Crises. The GHON utilizes the campus wide login for privacy. On September 11, 2016 the first World Sepsis Day Event was held to highlight the recent breakthroughs in the treatment and diagnosis of Sepsis and our understanding of the disease. We welcomed speakers, Keith Walley, and John Boyd, both from the Center for Heart Lung Innovation, UBC & St. Paul’s Hospital and Mark Ansermino from the Child and Family Research Centre. Dr. Niranjan “Tex” Kissoon, Vice-Chairman of the Global Sepsis Alliance Executive Board and VP Medical Affairs, BC Children's Hospital opened the event discussing the coordination efforts for a UN sanctioned Day for Sepsis, the first step to increase awareness and funding for this neglected disease. On June 18, members of the NGDI Advisory Board and representative students attended a Peter Wall Institute for Advanced Studies funded workshop. Attendees reviewed the history of NGDI’s role since its formation in 2009 as; 1) an advocate for its member’s accomplishments, 2) a network of expertise, 3) a convener of research meetings and educational conferences, and 4) a mobilizing entity for multidisciplinary team grants. There was continued agreement in the mission and vision of the Initiative. On May 5th, Dr. Howard Feldman, Executive Associate Dean Research, Faculty of Medicine held a town hall titled "A Call for Network Development". He outlined key national and international rankings and how the faculty of medicines strategic plan for global health has so far been met. Dr. Gina Ogilvie, Canada Research Chair and Professor, School of Population and Public Health, continued with an overview of the role of universities in global health and the importance of implementation sciences. Dr. Richard Lester, Director, NGDI, and Assistant Professor, Infectious Diseases introduced the Global Health Online Network developed to provide a conversational platform (password protected) for all campus global health enthusiasts. On November 13, 2014 UBC’s Neglected Global Diseases Initiative at UBC (NGDI-UBC) in partnership with the Vancouver Coastal Health Research Institute and The Centre for Drug Research and Development (CDRD), Canada’s national not-for-profit drug development and commercialization centre, brought together leading researchers from across the country to discuss Ebola Treatment and Action. The meeting focused on Canada’s current contributions to potential therapeutics in response to the 2014 West African outbreak of Ebola Virus Disease (EVD) and the opinions of Canadian Public Health officials and researchers for the prevention, and control of infection domestically. NEW Please access the event recording here. NEW The recorded program timing and speaker biographies is here. 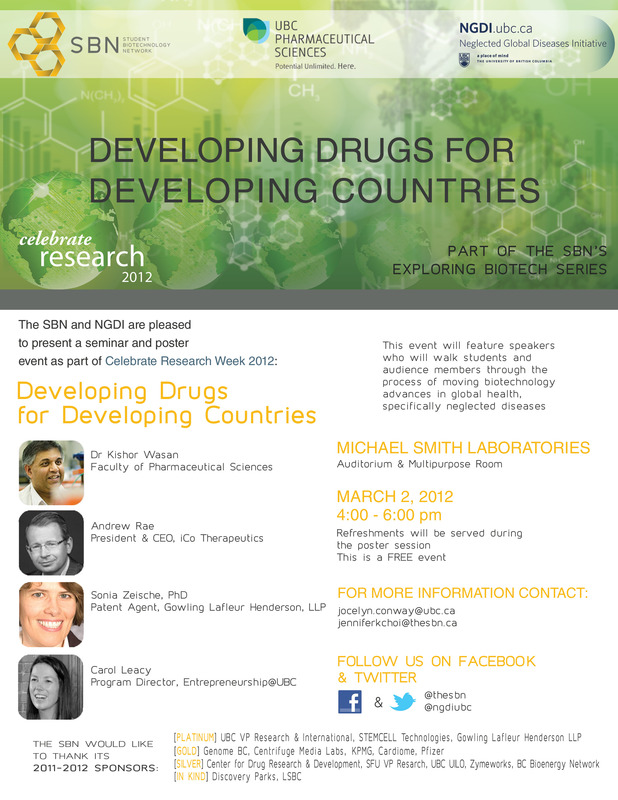 On October 31, 2014, the NGDI-UBC co-hosted with The Centre for Drug Research and Development (www.cdrd.ca) a talk with Dr. Kelly Chibale, Director of the Drug Discovery and Development Centre (H3-D) about the pioneering integrated drug discovery and development program in South Africa. Poster link. On February 13th, 2014, the NGDI-UBC hosted a UBC site meeting with representatives from Seattle-based BIO Ventures Global Health (BVGH). BVGH is in partnership with the UN’s World Intellectual Property Organization (WIPO) to host WIPO Re:Search, an intellectual property partnership sharing database that focuses on neglected disease work. President of BVGH, Ms. Jennifer Dent was accompanied by Associate Director, Partnering & Scientific Affairs, Dr. Roopa Ramamoorthi and Dr. Katy Graef, Manager, Special Projects. Read more. On January 24, 2014 Dr. David Zakus, Professor of Preventative Medicines, and Head of Global Health at the University of Alberta spoke on "Global Health: Reconsidering it's Meaning and Purpose to Everyone." See poster. On October 18, 2013, the Neglected Global Diseases Initiative at UBC (NGDI) held its ninth Distinguished Lectureship, featuring Dr. R.E.W. (Bob) Hancock. Dr. Hancock is a Professor of Microbiology and Immunology, an Associate Faculty Member of the Wellcome Trust Sanger Institute and a Canada Research Chair in Health and Genomics. In this lecture, Dr. Hancock posed the question, “What can we as a University community do about the Inequities of Poverty and Neglected Disease?” See poster. Global health leaders from across Canada met on May 3-4, 2013 to discuss the creation of a training program to educate the next generation of global health researchers. The meeting was hosted by the Neglected Global Diseases Initiative at The University of British Columbia (NGDI-UBC). The discussion revolved around an initiative that will bring together Canadian researchers who are widely acknowledged as world leaders in their fields from different universities into a single, coherent national global health training initiative. Read more. On March 6, 2013, Dr. Peter Singer, President & CEO, Grand Challenges Canada presented on the funding program and focused on Canada’s role in Global Health and particularly in the Neglected Global Disease work. See poster. On November 2, 2012, Dr. Clive Ondari, World Health Organization's Essential Medicines Branch presented "Providing Evidence-Based Norms, Standards and Guidelines for the Delivery of Health Solutions." See poster. On September 26, 2012, Dr. Karl Werbovetz, Professor of The Ohio State University College of Pharmacy presented his work on the role of Arylimidamides as Antileishmanial Drug Candidates. See poster. On April 20, 2012, Dr. Brett Finlay, Professor in the Michael Smith Laboratories, the Departments of Biochemistry and Molecular Biology, and Microbiology and Immunology at the University of British Columbia presented his work on The Role of the Microbiota in Enteric (diarrheal) and Allergic (asthma) Disease. See poster. On March 2, 2012 the Science Biotechnology Network (SBN) and the NGDI co-sponsored a talk series that walked the audience members through the process of moving forward biotechnology advances in global health - especially in the area of neglected global diseases. See poster. On March 16 and 17, 2012, this two-day conference titled "Knowledge to Action: Identifying BC's Contribution to Global Health Research" promoted global health research networking among individuals and institutions and provided mentorship to the next generation of researchers. See the poster. On February 24, 2012, Dr. Keith Martin, former MP spoke about bridging the knowlege- action gap using politics, partnerships and new tools to address the global health challenges of our time. See poster. On December 2, 2011, Dr. Stuart MacLeod spoke about the work he was doing with the UBC based International Alliance for Better Medicines for Children. See poster. On October 26, 2011 co-authors Drs. Abdallah Daar and Peter Singer presented their new book. The presentation was moderated by Videsh Kapoor, Assistant Clinical Professor & Director, Division of Global Health. View the poster. See the book review. On October 21, 2011, Director Jonathan Smith presented his documentary on HIV/AIDS and TB among gold-miners in South Africa. View a description of Jonathan Smith, his work, and the event itself here. On October 21, 2011, Mr. Stephen Lewis, co-director of AIDS-Free World, spoke to over 300 faculty and staff on neglected global diseases, followed by a period for Q&A. Around forty guests were invited to attend a private reception afterwards. View a summary of the seminar and pictures. On October 4, 2011, UBC Universities Allied for Essential Medicines (UBC-UAEM) held their annual Introductory Seminar, an educational event open to all university students. The seminar aimed to introduce students into the basics of access to medicines issues, and to discuss the projects UBC-UAEM is hoping to tackle in the new year. View the event poster and description. On September 28, 2011, the University of British Columbia launched an ambitious $1.5 billion fundraising campaign and highlighted Dr. Wasan's work on neglected diseases. View the press release of the campaign launch and a posting of the event on our website. 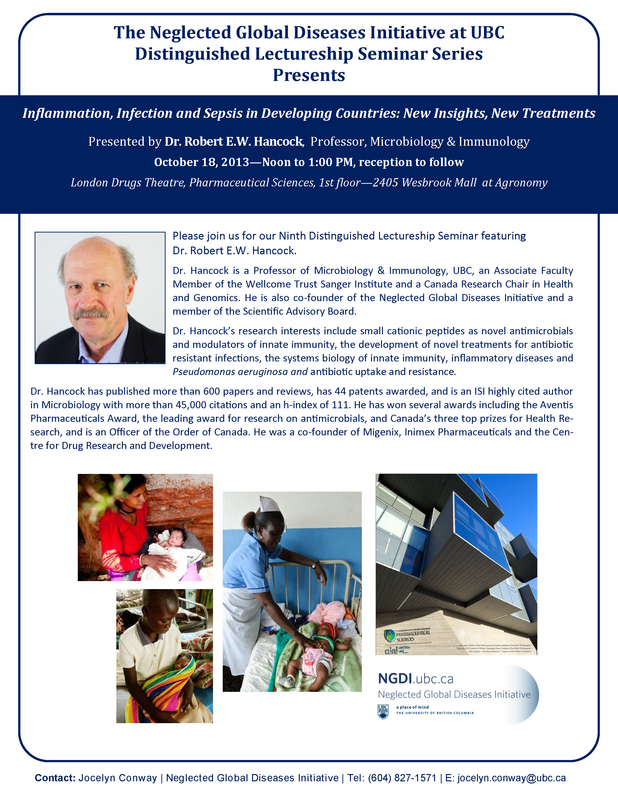 On August 26, 2011, NGDI and the Pharmaceutical Sciences presented a talk by Dr. François Jean, the Scientific Director of the UBC Facility for Infectious Disease and Epidemic Research (FINDER). See poster. On August 16 to 19, 2011, students from Central Michigan University (CMU) were sponsored by Dr. Kishor Wasan and the NGDI for a visit to UBC. View a description of the event on our website. On June 16, 2011, Dr. Ondari met with Dr. Kishor Wasan and Jocelyn Conway to discuss collaboration possibilities, and a roundtable event faciliated by Dr. Jerry Spiegel and Benjamin Warren followed. View a description of the event on our website. On May 13, 2011, Dr. Julio Montaner lectured at NGDI's second Distinguished Lectureship Seminar on HIV/AIDS treatment as prevention. View a brief description and a full summary of the event on our website. On May 6, 2011, Lawrence Meadows, Business Development Director at MITACS presented to faculty members and graduate students detailing information on the Accelerate and Elevate Programs. View a summary of the presentation on our website. On March 4, 2011, NGDI organized a series of presentations and poster competition as an event during Celebrate Research Week. Guest speakers Drs. Lindsey Eltis, Rebecca Goulding, Peter von Dadelzsen and Mr. Angus Livingstone presented on topics such as tuberculosis, neglected diseases, global accessibility and reproductive health. View a summary of the event on our website. You can view the talks here. On January 14, 2011, NGDI held the first Distinguished Lectureship Seminar. Dr. Michael Hayden, the inaugral speaker, highlighted the great work that he has been doing in South Africa and with his international Ripples of Hope Award. View a summary of the event on our website. On September 18 and 19th, 2010, NGDI held their first symposium. Keynote speaker was Dr. Thomas Kanyok of the Bill and Melinda Gates Foundation and guest speakers were Drs. Nigel Fisher, Peter Singer, and Shyam Sundar. You can view the talks here. On January 11, 2010, NGDI held a stakeholder meeting to discuss the organization's strategic plan. View the event posting on our website.